Delivered in a rectangular basket with handle. This item is hand-arranged and delivered by a local florist. 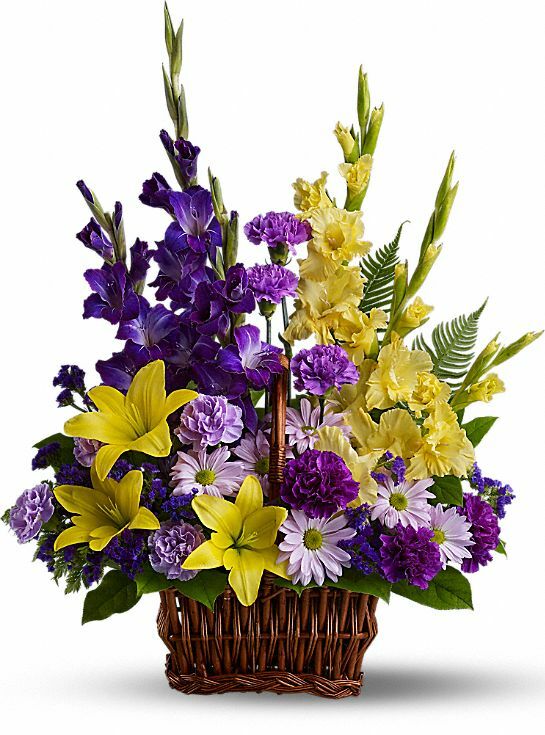 * The local florist will fulfill the order as closely as possible to your selection depending on availability of inventory. If the exact flowers or container you have selected are not available, your florist will substitute only items of equal or higher value to create a bouquet with the freshest available flowers. We were blown away with how the basket of memories looked. Even better in person. We arrived at the funeral home and knew immediately which basket was ours. This basket recieved many compliments! thank your for helping us pick it out! It's hard to be sad when you see something this colorful and beautiful ! We aren't familiar with ordering flowers from the Tribute Store, but the representative walked us through everything. They were very polite. Thank you! This stood out among the flowers at the visitation. Loved the colors! So happy we went with these!! The purple and lavendar carnations were a nice touch. We loved these! We were able to send the right to where the service was being held, making it easy on us! Like someone else said, its a basket of springtime! Perfect! It's a very beautiful arrangement. Thank you for taking the headache out of ordering flowers online! It looked even better when we saw it in person! You won't be disappointed with this basket! We never actually saw the basket, but our uncle Jim sent us a picture. He told us how many compliments they got. If you choose same-day delivery, be sure to place your order before 3:00 PM Monday through Friday, or by 12:00 PM on Saturday in the recipient’s time zone. Please note that same-day delivery might not be available during peak holiday times or in certain weather conditions. The local florist will fulfill the order as closely as possible to your selection depending on availability of inventory. If the exact flowers or container you have selected are not available, your florist will substitute only items of equal or higher value to create a bouquet with the freshest available flowers. We’re proud to offer you a wide selection of arrangements and we work closely with our florists to make sure your designs are created using only the freshest flowers in store. Your order will be filled by an experienced professional and hand-delivered to your chosen recipient. By partnering with local florists, we are able to enforce strict guidelines for quality and service to ensure your complete satisfaction with the products you receive.